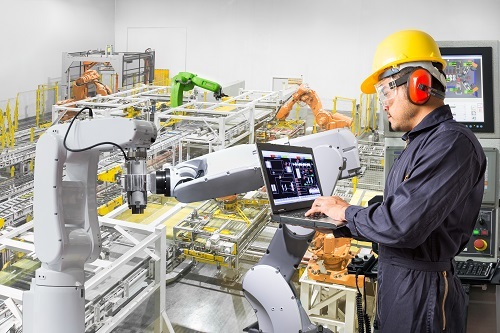 As the plant floor has become more digitally connected, the relationship between robots and machine vision has merged into a single, seamless platform, setting the stage for a new generation of more responsive vision-driven robotic systems. BitFlow, Inc., a global innovator in frame grabbers used in industrial imaging, predicts vision-guided robots will be one of the most disruptive forces in all areas of manufacturing over the next decade. "Since the 1960s robots have contributed to automation processes, yet they've done so largely blind," said Donal Waide, Director of Sales for BitFlow, Inc. "Vision-equipped robots are different. Now, just like a human worker, robots can see a specific part to validate whether it is being placed correctly in a pick and place application, for example. Cost savings will be realized since less hard fixturing is required and the robot is more flexible in its ability to locate a variety of different parts with the same hardware." Using a combination of camera, cables, frame grabber and software, a vision system will identify a part, its orientation and its relationship to the robot. Next, this data is fed to the robot and motion begins, such as pick and place, assembly, screw driving or welding tasks. The vision system will also capture information that would be otherwise very difficult to obtain, including small cosmetic details that let the robot know whether or not the part is acceptable. Error-proofing reduces expensive quality issues with products. Self-maintenance is another benefit. If alignment of a tool is off because of damage or wear, vision can compensate by performing machine offset adjustment checks on a periodic basis while the robot is running. In should come as no surprise that the machine vision and robotic markets are moving in tandem. According to the Association for Advancing Automation, robot sales in North America last year surpassed all previous records. Customers purchased 34,904 total units, representing $1.896 billion in total sales. Meanwhile total machine vision transactions in North America increased 14.8%, to $2.262 billion. The automotive industry accounts for approximately 50 percent of total sales. Innovations in how vision-guided robots perceive and respond to their environments are exactly what manufacturers are looking for as they develop automation systems to improve quality, productivity and cost efficiencies. These types of advancements rely on frame grabbers being paired with high-resolution cameras to digitize analog video, thus converting the data to a form that can be processed by software. BitFlow has responded to the demands of the robotics industry by introducing frame grabbers based on the CoaXPress (CXP) machine vision standard, currently the fastest and most powerful interface on the market. In robotics applications, the five to seven meters restriction of a USB cable connection is insufficient. BitFlow CXP frame grabbers allow up to 100 meters between the frame grabber and the camera, without any loss in quality. To minimize cabling costs and complexity, BitFlow frame grabbers require only a single piece of coax to transmit high-speed data, as well as to supply power and send control signals. BitFlow's latest model, the Aon-CXP frame grabber, is engineered for simplified integration into a robotics system. Although small, the Aon-CXP receives 6.25 Gb/S worth of data over its single link, almost twice the real-world data rate of the USB3 Vision standard and significantly quicker than the latest GigE Vision data rates. The Aon-CXP is designed for use with a new series of single-link CXP cameras that are smaller, less expensive and cooler running than previous models, making them ideal for robotics.